Lace bugs feed by sucking juice from plant leaves, extracting the protein they need and excreting the excess juice as honeydew. The most common symptom of feeding is the stippled and mottled yellowish foliage. Positive signs of lace bugs are the insects, whitish cast-off skins, and/or dark brown tar-like excrement on the underside of the leaves. In heavy infestations, black sooty mold, a non-parasitic fungus, may develop on the honeydew. If leaves become covered with sooty mold, photosynthesis production is reduced, thereby reducing the production of carbohydrates needed by the plant. Damage is most severe on plants in full sun. Heavily damaged leaves become blanched and yellowish grey and may drop from the plant. This often results in some dieback of twigs and branches and a reduction in flowering the following spring. 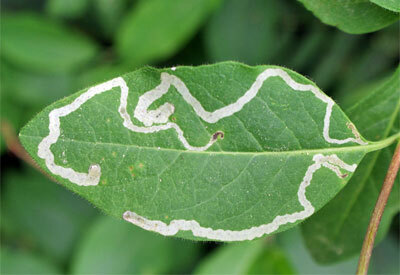 Various types of leafminers attack various kinds of plants. They’re found on broadleaf trees, including elm, aspen, hawthorn, and poplar as well as shrubs and bushes, including lilacs. 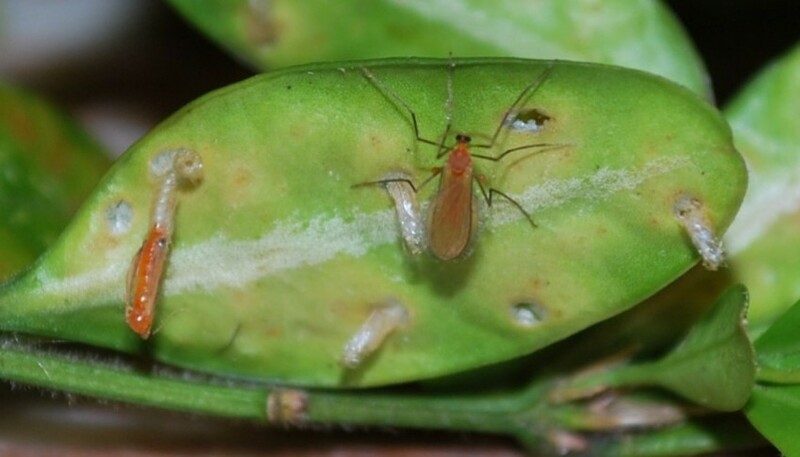 Damage can be limited in initial stages of infestations but increase as leafminer numbers multiply, and even minor infestations, while not killing a plant, will cripple its hardiness. 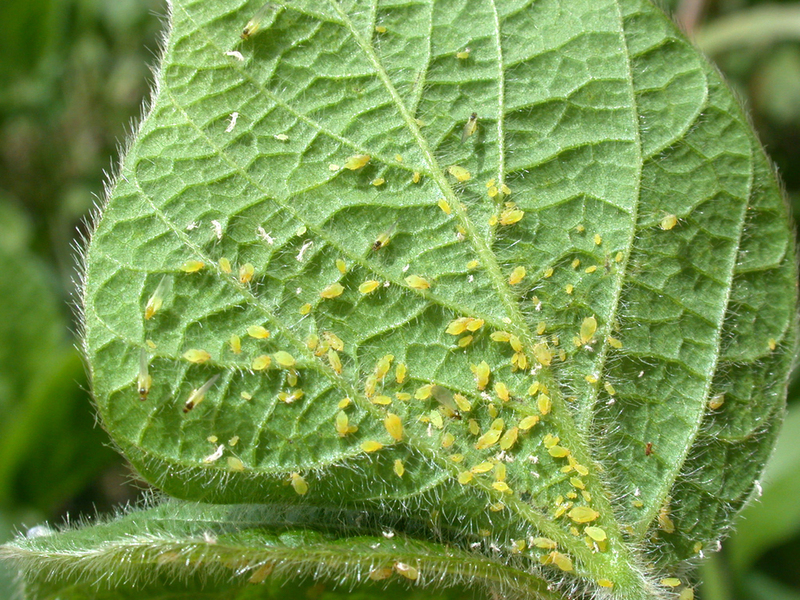 Leafminers are a major cause of poor harvest numbers in home gardens as they weaken individual vegetable plants. They’re especially fond of spinach leaves and their tunneling severely decreases the attractiveness and value of the crop. 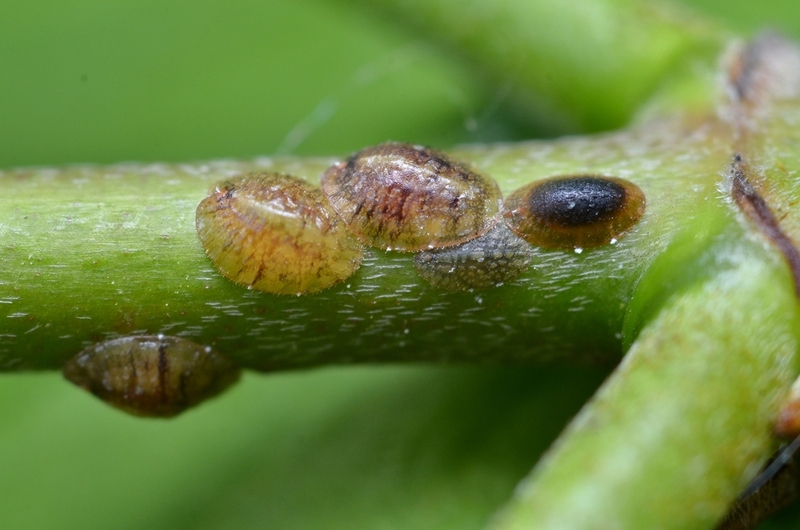 Scale insects thrive in warm, dry environments. The scale bug is small, oval and flat, with a protective tan to brown shell-like covering (scale). Scale generally targets the undersides of leaves and around leaf joints. Armored Scale: The armored and soft scale bug is the most destructive. Armored scales are more difficult to control once mature. Soft Scale: Soft scale bugs excrete large amounts of honeydew, which enables the growth of sooty mold, a black-colored fungus that interferes with photosynthesis. Mealybug: Mealybugs are easier to control. Scales cannot fly; therefore, dispersal depends on the movement of crawlers. Crawlers may be detected by placing double-sticky tape on plant branches. The symptoms of a psyllid infestation are cupping of the young terminal leaves as they begin growth in spring. The psyllid nymphs will be visible inside the cupped leaves although the most obvious sign is the waxy filaments and secretions they produce. Boxwood psyllids have one generation per year. They overwinter as eggs in small orange spindle-shaped eggs that have been laid in between bud scales. Emerging as the new growth begins in April to May and feeding on the buds and young leaves, the nymphs are light green and may have dark markings. They produce and are partly covered with waxy filamentous secretions. The sucking damage causes the leaves to cup and creates a protected area for the developing nymphs. They mature into light green, 1/16 inch long adults that look like miniature cicadas in late May to early June. The adults lay eggs in the bud scales in June and July. Fungal spores are spread by wind and overwinter on plants and in plant debris. Unlike mildews that appear in bathrooms or basements, powdery mildew does not need direct contact with water in order to grow. The warm days and cool nights of late summer create an ideal climate for spore growth and dispersal. Powdery mildew is the blanket name for a few different species of fungi that infect many ornamentals, such as beebalm (Monarda), lilacs (Syringa), zinnias, roses, and garden phlox (P. paniculata). It also affects vegetables, including beans, cucumbers, grapes, melons, and squash. Powdery mildew is unattractive and it can affect the flavor and reduce yields of some fruits and vegetables. Although plants are unsightly and can be weakened by an infection, they do not usually die. 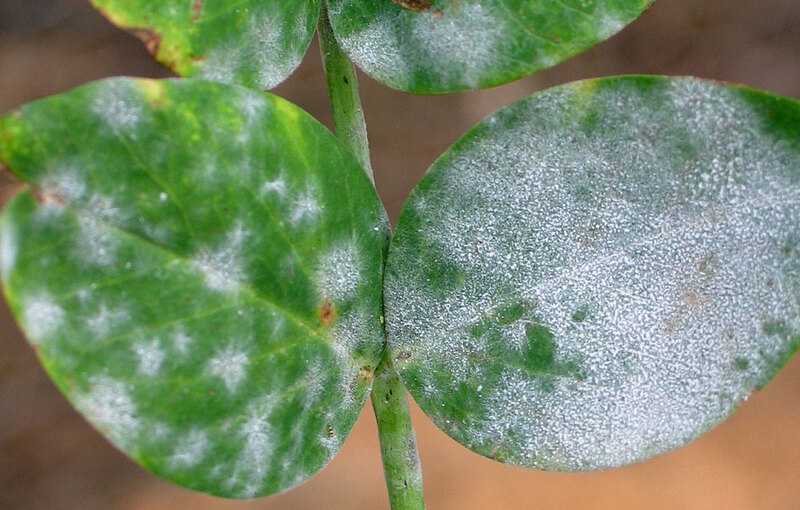 Powdery mildew on ornamentals is an aesthetic issue, and not usually worth treating. Prevention and control is more important for vegetables. Leaves will appear drought stressed, sometimes turning dull green, yellow, red, or purple as they wilt. Infected trees may survive a few years before the disease kills the whole plant. The bark around the soil-line may appear darkened. Cutting away some bark should reveal red-brown discoloration in the wood underneath it. Disease symptoms are distinguishable from Armillaria root rot because mycelial mats do not develop in tissues infected with Phytophthora root rot. Root rot-causing Phytophthora species can survive in the soil for years, as long as moist conditions persist. It can spread through splashing rain, irrigation water, and runoff water. Disease fungi can spread through contaminated soil and garden equipment as well. 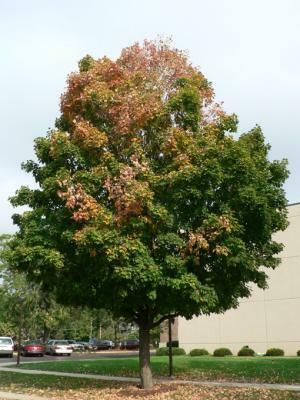 Rot is more likely to spread in early spring and late fall during cool, rainy weather. But symptoms are more likely during stress periods of low rainfall. Flooded and saturated soil conditions for 6–8 hours are especially conducive to the spread of root rots. Wounds are not required for infection. Symptoms on juniper: Brown, perennial galls form on twigs. When mature (usually in two years), the galls swell and repeatedly produce orange, gelatinous telial horns during rainy spring weather. The galls of cedar-apple rust are often over 2 inches in diameter, while cedar-hawthorn rust galls are rarely over 2 inches in diameter. Occasionally the twig beyond the gall dies, but usually no significant damage occurs on the juniper host. Symptoms on apple (or crabapple): Circular, yellow spots (lesions) appear on the upper surfaces of the leaves shortly after bloom. In late summer, brownish clusters of threads or cylindrical tubes (aecia) appear beneath the yellow leaf spots or on fruits and twigs. The spores associated with the threads or tubes infect the leaves (needles) and twigs of junipers during wet, warm weather. On juniper, galls appear about seven months after infection, and they form gelatinous masses of spores after 18 months. Golf ball-like depressions form on the gall that will give rise to telial horns the following spring. The telial horns are brownish in color, but rapidly elongate and become bright orange with spring rain, shrinking and swelling with intermittent rainfall. After releasing their spores, the horns collapse, dry, and eventually fall off. The galls die at this point, but may remain attached to the juniper for a year or more. This rust is very obvious on red cedar and other junipers during spring, when the galls are covered with orange-brown gelatinous masses. Rust spores formed on the gelatinous masses cannot infect other junipers but can infect only certain susceptible species of the rose family. On apples and crabapples the circular, yellow lesions on the upper surfaces of the leaves appear shortly after bloom. Wet, rainy weather in early spring is conducive for twig, leaf and fruit infection of these deciduous hosts. Heavy rains within the first two weeks of budbreak and leaf expansion cause the disease to be more severe. As the disease progresses, the undersides of the leaves below the yellow spots will develop raised orange structures that will ooze from the center, turn black, and appear as black dots. In late summer, this area will produce the orange and brown rust-colored spores that infect the juniper host, completing the cycle. Severely infected leaves may drop prematurely, especially during a dry summer. The fungus Rhizosphaera kalkhoffii causes needle cast of spruce. It mostly occurs on spruces that are not being grown in their native habitat. 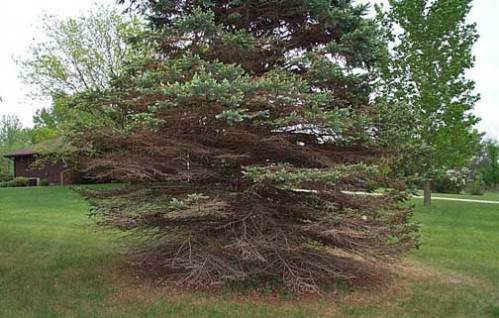 The Colorado blue spruce is the most susceptible spruce to this disease. White spruce is moderately resistant and Norway mostly resistant. The other spruces fall somewhere in between susceptible and resistant. Other conifers may also be hosts including some pines such as Austrian pine. Infection occurs in the spring usually on lower branches and works upward around the tree. Some times the disease may start higher and then work downward. Any size tree may be attacked but small trees are more susceptible and are more likely to be killed by serious yearly infection. Infected foliage usually turns a mottled yellow in late summer on current year needles. During the late winter and early spring, the needles turn brown (purplish brown on Colorado spruces). These discolored needles then fall off during the summer and fall leaving current year needles. Verticillium wilt, caused by the fungi Verticillium albo-atrum and V. dahliae, is a serious vascular disease of hundreds of woody and herbaceous plant hosts. Food crop hosts include everything from raspberries and strawberries, to tomatoes and potatoes. Wilting of leaves and dieback of branches, often one at a time or on one side of the tree, are the most severe symptoms. This can occur over a number of years, with remission of symptoms in some years, or can rapidly progress to plant death in a year or two. 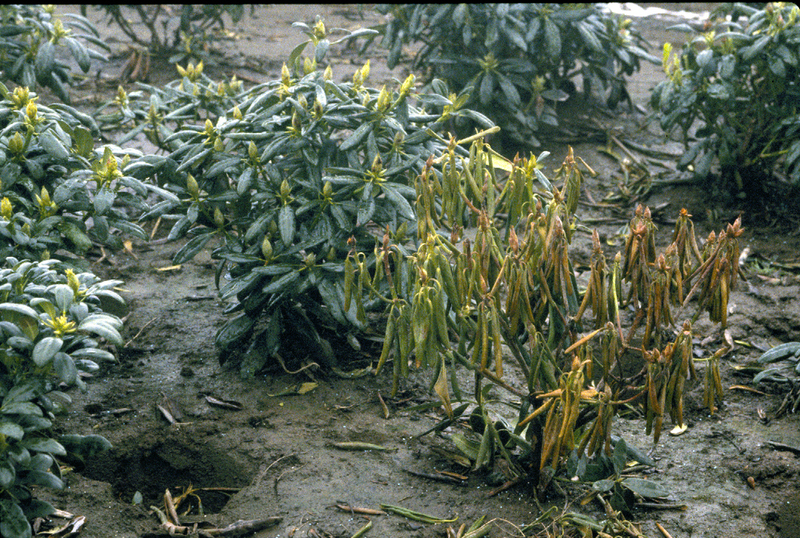 Other symptoms of Verticillium wilt may include: marginal browning and scorch of leaves, abnormally large seed crops, small leaves, stunting, poor annual growth, and sparse foliage. Sometimes large areas of cambial tissue die from infections by the fungus and opportunistic fungi such as Nectria develop in elongated cankers. Late season infections may not be noticeable until plants come out of dormancy with branch dieback evident. Leaf spot is a common descriptive term applied to a number of diseases affecting the foliage of ornamentals and shade trees. 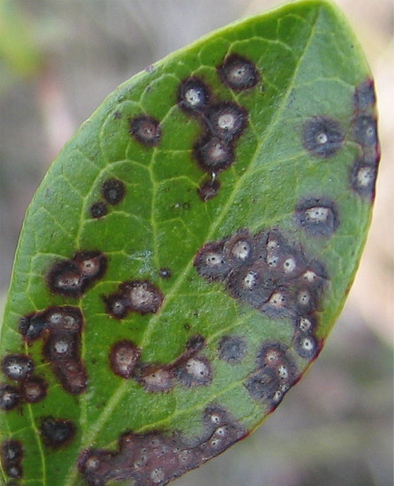 The majority of leaf spots are caused by fungi, but some are caused by bacteria. Some insects also cause damage that appears like a leaf spot disease. Leaf spots on trees are very common and generally do not require spraying. Leaf spot may result in some defoliation of a plant. An established plant can tolerate almost complete defoliation if it happens late in the season or not every year. Small or newly planted trees that become defoliated are more at risk of suffering damage until they become established. The chief symptom of a leaf spot disease is spots on foliage. The spots will vary in size and color depending on the plant affected, the specific organism involved, and the stage of development. Spots are most often brownish, but may be tan or black. Concentric rings or dark margins are often present. Fungal bodies may appear as black dots in the spots, either in rings or in a central cluster. Over time, the spots may combine or enlarge to form blotches. Spots or blotches that are angular are generally referred to as anthracnose (see entry on “Anthracnose of Trees”) Leaves may yellow and drop prematurely.